Tosafist of the thirteenth century. The surname "Porat" is an allusion to Gen. xlix. 22. According to Gross, Joseph Porat is identical with Joseph of Caen, who is cited by Samuel of Falaise as a rabbinical authority; but he can not, as supposed by Dembitzer ("Ha-Ḥoḳer," ii. 48 et seq. ), be identified with Joseph ben Moses of Troyes, the codisciple and opponent of Jacob Tam. Joseph Porat was the pupil, and perhaps the grandson, of Samuel ben Meïr (RaSHBaM), but certainly was not his son, as erroneously given by Zacuto ("Sefer ha-Yuḥasin," ed. London, p. 218). Joseph Porat wrote a commentary on the Talmud, fragments of which are found in the Tosafot to Shabbat (52a) and Yoma (37b, 46a). According to Dembitzer (l.c. ), all the passages cited in the Tosafot in the name of Joseph without any further indication are to be attributed to Joseph Porat, who is probably also the author of a mathematical work found in the Oppenheim collection under the name of Joseph ben Moses Ẓarfati. 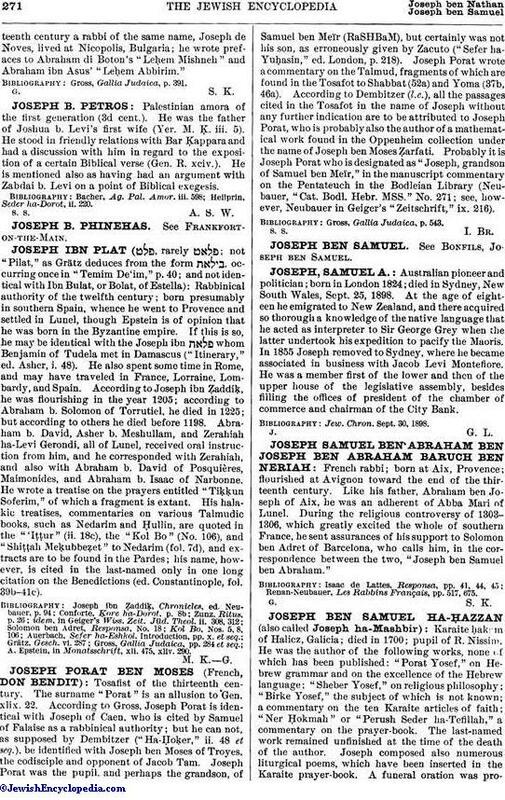 Probably it is Joseph Porat who is designated as "Joseph, grandson of Samuel ben Meïr," in the manuscript commentary on the Pentateuch in the Bodleian Library (Neubauer, "Cat. Bodl. Hebr. MSS." No. 271; see, however, Neubauer in Geiger's "Zeitschrift," ix. 216). Gross, Gallia Judaica, p. 543.